So, we’ve already had the leisurely sail across the the stretch of water where the Bosphorus meets the Marmara Sea and taken in the views from the Eminönü Kadıköy ferry. Now, we’re getting off the ferry to explore a tiny section of the Asian side of Istanbul, Kadıköy – but we want to show you our Kadıköy. We’re no experts on the area; merely explorers. But you can come along and explore with us. 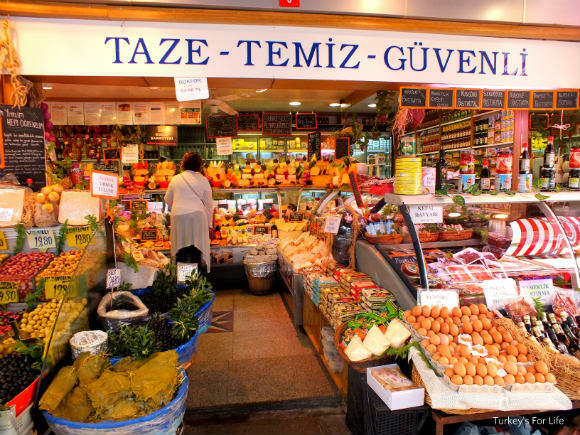 And first of all, if you’re food market enthusiasts like we are, we want to show you a little bit of Kadıköy market. When you get off the ferry in Kadıköy, your feet lead you across the road and straight up a busy main road, Söğütlü Çeşme Caddesi. It’s off this road, to the right where we love to wander aimlessly around the narrow pedestrianised streets – bars, restaurants, meyhanes, coffee shops – and Kadıköy market. There’s a huge, separate Tuesday market in Kadıköy, too, but for this post, we’re concentrating on daily perusing of all things excitingly foodie. If we lived in Istanbul, what a fantastic magnetic attraction this neighbourhood would be, just for the food alone. 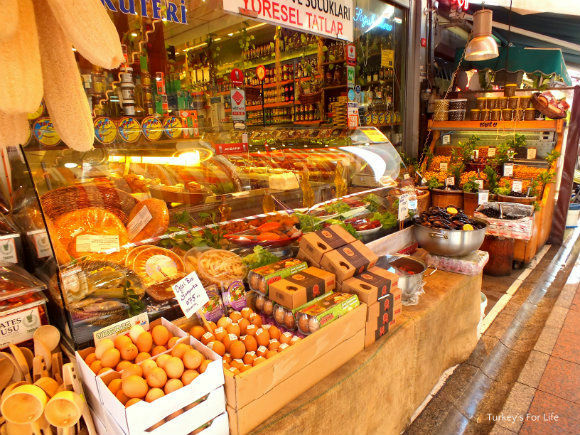 Kadıköy market has just about everything you could possibly need and want in your pantry – and more besides. 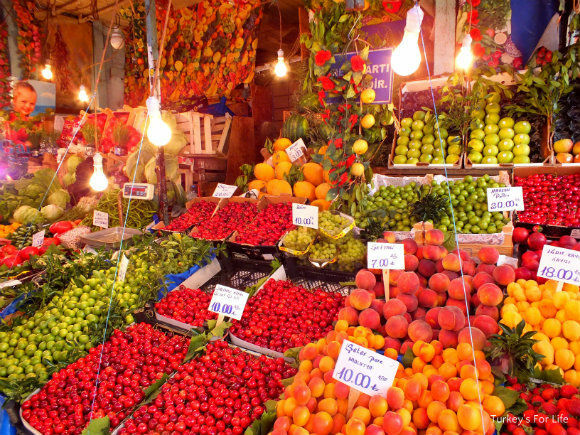 Here we are, in the middle of what’s described as the cultural capital of the Anatolian side of Istanbul; bars and restaurants galore…and we can shop for our seasonal fruit and vegetables. It was springtime when we were walking around Kadıköy market so cherries and erik (greengage) had just made an appearance. The colours, the colours…how can you not want to fill your shopping bag with all of this fruity loveliness? How long could you spend in this shop? …Vine leaves, olives of all strengths, colours and varieties. We were en route to Italy to see friends when we were in Istanbul so it was from one of these shops in Kadıköy market that we made a purchase. Our friends love Turkey so we thought it would be nice to take something quintessentially Turkish along with us to share. We had no idea what to take with us; we’d know when we saw it. And we weren’t particularly looking for anything as we coveted just about everything we laid our eyes on – but then there it was on one of the shelves; the perfect gift. Interspersed between the fruit stalls, flower stands, cheese and yoghurt stalls, dried foods and herb stalls, are also fish stands. We’re in northwest Turkey in a huge city so the fish stalls at Kadıköy market are packed with all sorts of seafoods. Some of the produce is the same as the seafood we see often on Fethiye fish market; Sea bass and sea bream, salmon (oft imported from Norway), calamari and an array of prawns of various sizes. Naturally, there’s usually a cute cat around these places, keeping a low profile yet letting the fishmonger know its there, just in case there are any ‘extras’ going spare. 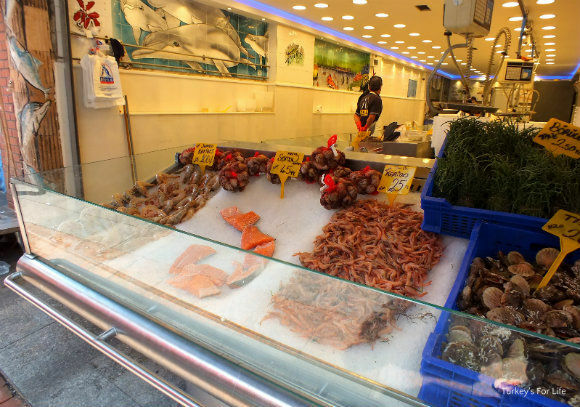 Kadıköy market has shell fish! We just had to include this photo. 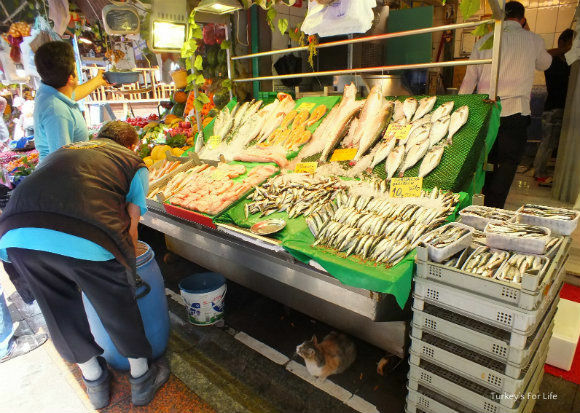 This Kadıköy market fish stall is hardly brimming with fish and other seafoods but it made us stop in our tracks! First of all, just look at the size of those prawns at the end. No wonder they’re 100 TL per kilo…but you’d only need a handful of those beauties to make an amazing king prawn jalfrezi, wouldn’t you? But it was the blue crate and the mesh bags that got us excited. We love to eat stuffed mussels (midye dolma) in the streets of Turkey but we do often say that one thing we miss, living here, is shell fish. Just that choice in a restaurant of ordering some scallops as a starter, or buying a tub of strong vinegared cockles by the seaside. Ohhh, well, if you lived in this neighbourhood, you could take yourself off to Kadıköy market and buy yourself some. We’re not exaggerating when we say we were genuinely gleeful and excited to see these shell fish. We know where we’re coming food shopping next time we stay in Istanbul! What’s a produce market without turşu? 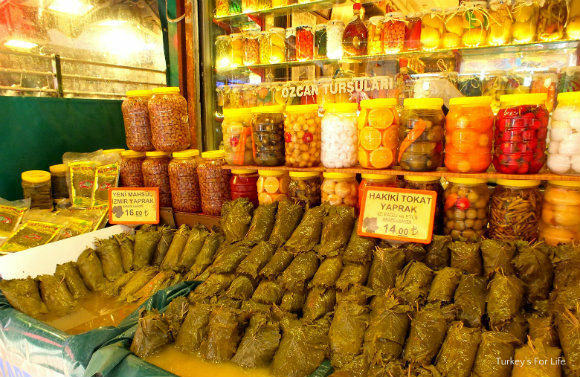 Because, if you know Turkey, you won’t be surprised to know that whilst you’re doing your food shopping / browsing around Kadıköy market, you can also stock up on that Turkish staple; turşu. Over the water, on the European side of Istanbul in Beyoğlu, we love to go to Petek’s to breathe in the pickling aromas, marvel at the colourful, neatly arranged displays…and, once we’ve done that, we buy some pickles, too. This establishment in the photo above isn’t quite so photogenic as that – but who cares when your mouth is already watering in anticipation of the flavours that are going to hit your tongue when you open one of those plastic tubs. Fellow pickle lovers will appreciate what we’re getting at, here. You can book hotels in Kadıköy and other parts of Istanbul through Booking.com. One of the many things I miss about living in Istanbul is the wonderful markets. Especially the fish markets. This is my stamping ground! I know this area like the back of my hand and it never ceases to make me happy that I have it on my doorstep! so nice to see it featured here! Let me know next time you come, OK? 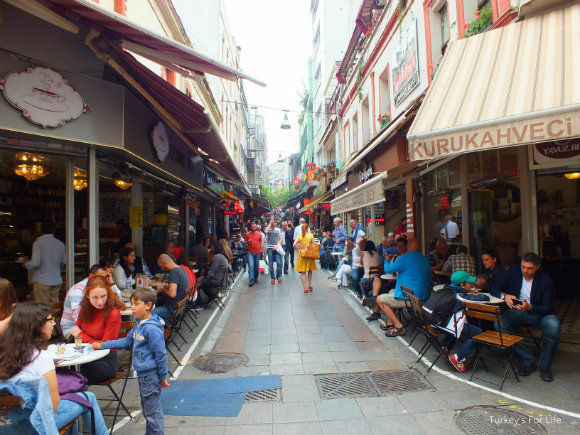 I loved exploring Kadıköy, and now wish I had done it more often when we lived in Istanbul! As I mentioned on Google+, there’s a super yummy baklavaci nearby the market. Also, there’s a shop that sells Turkish towels and Made-in-Turkey William-Sonoma kitchen towels dirt cheap, like 3xs less than their cost in the US – always good for gifts. We used to go to the Kadıköy market for the big shopping sprees, when we lived in Istanbul a hundred years ago. At that time, you could hire a man with a giant basket on his back to carry the groceries home for you. I wonder if that’ kind of private delivery service still exists?